Roberts expands Wi-Fi radio range with four new portables | What Hi-Fi? The Stream 83i sports Wi-Fi, DAB and FM radio inside a retro-styled cabinet in a high gloss piano black finish. There are snooze, alarm and sleep timers, plus USB playback. A 'LAST FM' function meanwhile promises to build a virtual radio station for you over time based on the music you listen to on the radio. This will be joined in shop shelves before Christmas by the STREAMTime, also offering a Listen Again feature, 10 station presets and clock radio and alarm functions. The Stream 83i and STREAMTime will set you back £150 and £120 respectively. Next year they will be joined by the Sound 63i (pictured) and the COLOURStream radio systems. 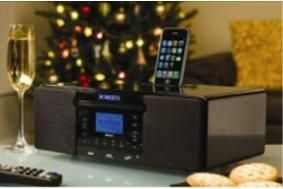 Both have DAB/FM and Internet radio, plus an iPod dock and touchscreen control. The Sound 63i also adds a CD drive.